Due to rising cost prices, retail prices are subject to change. We will notify you of any price changes before shipping your orders. Note: If you need help with how to use our Online Store, please see the Shopping Cart Help Page. We accept all of the following major credit cards, Visa, Master Card, and Discover. We are required by law to collect sales tax on all orders being shipped within Florida. Order line and information: 1 954 561 1716. 1040 E. Oakland Park Blvd. All merchants and non-profit organizations in the state of Florida that have resale numbers should include their resale number in the additional comments box when checking out. In addition, we will need a hard copy of your resale certificate. You can either fax us a copy to: 1 954 565 8149, email it to rachel@constantines.com or send us a copy in the mail using the address above. For orders shipped to the 48 contiguous United States, refer to the chart below. FLAMMABLE ITEMS cannot be shipped out of the USA. For shipments to Alaska, Hawaii, Puerto Rico, Guam, the US Virgin Islands, all APO, FPO and foreign addresses, postage is determined by weight and destination. If you order via the internet, we will e-mail you a shipping quote within 24 hours. If possible, please include a fax number where you can be reached in the case that we cannot reply to your email address. Once you receive our quote, please reply with a confirmation. Upon receipt of your confirmation of the shipping method and charges, we will immediately ship your order. Note: International customers are responsible for paying customs charges and any other applicable fees or taxes required. Need faster service? Please call us at 954-561-1716 and let us know. All air orders must be placed by 12:00 pm Eastern Time to assure same day shipping. NOTE: FLAMMABLE ITEMS cannot be shipped by Air and cannot be shipped out of the USA. For additional questions regarding shipping rates, please call (1 954 561 1716). Once you place your order with one of our customer service representatives, he/she will assist you in choosing one of these services. There are a few items in our catalog on which we must charge actual shipping costs due to their overall size and weight. Our 7/8' mahogany is one such exception. We will advise you on the actual cost before shipping any of these items. In addition, all orders for special merchandise (items we do not stock) will be charged the actual shipping costs. If any part of your order is damaged, or if you are dissatisfied with it for any reason, you may return it within 30 days for a replacement or refund. Please note that specially ordered or customized products are returnable only if defective. ALL CLEARANCE AND CLOSEOUT ITEMS ARE NON-RETURNABLE! NO RETURNS ON ANY TYPE OF FINISHING PRODUCTS OR GLUE!! 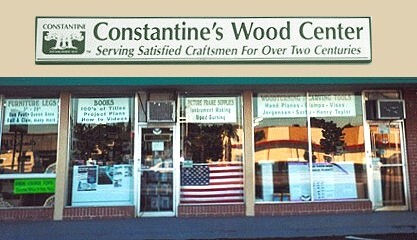 To check on the status of an order, you can contact our Customer Service Department at info@constantines.com or call 1 954 561 1716.